Our two dams have seen some much-needed water flow into the dams, whilst it wasn't a huge amount, it's still enough to lift the level and keep the fish active. 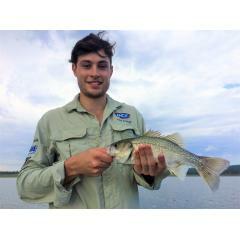 Both dams haven't changed much as far as the fishing goes and there are huge amounts of opportunity to get amongst some great fishing for natives on Boondooma and BP. There's a couple of good fishing options for Boondooma this month. Early on in the day, your best option would be to hit the trees in either the Stuart or Boyne arms chasing Bass, Yellow Belly or even Saratoga amongst the spindly timber. I usually start here first when the arms are quiet and it usually pays off. I like to cruise amongst the trees with the electric motor and cast 5/8 Bassman Spinnerbaits or soft lipless cranks in tight to the spindly trees, let the lure sink from 3 to 5 seconds and start my retrieve. This usually accounts for a few Bass and Yellow belly. The Goldens particularly like lipless cranks cast tight to the structure and the Bass tend to hit as the lure bounces over the underwater structure. If you're after a Saratoga casting surface lures when the water is still is a great way to catch one of these prehistoric fish. These techniques are a great way to fish and it can be nail biting stuff at times, especially when you hook up to a quality fish. Later in the day when the sun is up, I'd be moving out to the main basin and sounding for concentrations of fish in the 15 to 25 foot range. This time of year the fish that sit in this zone called the "thermocline" are a real sucker for slow retrieved or burned 5/8 spinnerbaits, 1/2 ounce rigged plastics and 18 gram Norries spoons. So give this a try next time you're out, but make sure you find some good shows of fish on the sounder before you start casting. It pays to put the work in to find them because you can be greatly rewarded. Trollers are getting some big Bass in the main basin trolling 5/8 spinnerbaits, mainly around the Barbour's pole area, the dam wall, Leisegangs ledge and Pelican point. Be patient and the rewards will come. BP has been the pick of the dams as far as numbers of fish go. Sessions of 20 to 40 plus fish are not uncommon and if you put the work in you can get some quality as well. A few areas that have been fishing well lately are the open water straight out from the park boat ramp, wide of the Quarry and wide of bass point. Make sure you ask the guys at the kiosk if you want to know these areas. Soft plastics rigged on a 1/2 ounce head have been very effective. Soft Vibes and spinnerbaits are also a great go to lure if the fish are sitting up off the bottom with a burn and kill retrieve. It was great to see another record attendance at the Annual Yellow belly comp this year. Everyone was well behaved and most people caught fish. A huge thank you to everyone that attended this year's event and made the weekend such a huge success. Thanks to the Boondooma stocking group lead by Terry Allwood who made it so enjoyable. These guys will put the money back into fingerlings for the dam to keep flourishing for years to come. Now that were coming into the Easter break the dams will become quite busy, can I please remind everyone to be weary of the 6 knot zone in front of the camping areas and please make sure you have your SIPs permit and life jackets. Fisheries QLD will be visiting quite often over the Easter break and we'd hate to see you fined. Don't forget that you can book a fishing charter with me on BP and Boondooma dams. If you'd like a great day out and all the info and knowledge to catch Bass or Yellow belly in our two great dams make sure you give me a call on 0408658592 and I'll be happy to take you out for a great days fishing. That's it for this month's report.